As kids’ entertainment characters go, “a frog named Sam” isn’t the most original concept in the world — and neither is the story at the heart of this album’s title track, about the titular amphibian and his journey from backwater pond to the big city and back again. Heck, even A Frog Named Sam‘s artwork is fairly amateurish, so a person could be forgiven for having low expectations for the album…expectations that will be exceeded within the first few moments of listening to the deadpan vocals, tribal jam band beat, and — of course — ribbiting of the leadoff track. What Ben Rudnick and Friends lack in conceptual originality, they more than make up for with a musical approach that can best be described as “Beausoleil for tots” — plenty of upbeat, danceable rhythms, tasty acoustic guitar fills, mandolin, harmonica, and accordion, all draped around an assortment of the usual kids’ subjects: talking animals, trains, family love, and friendship. So no, A Frog Named Sam doesn’t break any new lyrical ground, but it’s still some of the most fun I’ve had with a kids’ album this year, and it’s a testament to Rudnick and Friends’ originals that songs like the wonderful “Drink It Up” (“it’s like a milkshake when I see your face/I want to drink it up and take it with me”) stand shoulder-to-shoulder with well-chosen covers like “Old Joe Clark,” “Erie Canal,” and my daughter’s personal favorite, a shifty, album-closing take on “Greensleeves” (her quote: “It tricks every part of your body. I thought, ‘What the heck, ‘Greensleeves’? You tricked me'”). If your tastes run toward the Subdudes/Beausoleil/Beau Jocque end of the spectrum, A Frog Named Sam should provide hours of entertainment for you and your kids — you can dance to the instrumental jigs, laugh at the stories of Sam the frog and the three little fishes, and simply enjoy the positive, uplifting tone of the entire album. Though I found the band’s take on “Erie Canal” to be a bit lackluster, there really isn’t a bad song on the album. We’ll be listening to this one for a long time. This entry was posted in Music and tagged Accordion, Arts, Ben Rudnick, CD Review, Compact Disc, Erie Canal, Frog Named Sam, Guitar, Jam band, Jeff Giles, Joe Clark on April 5, 2009 by Jeff Giles. It seems to me that if a kids’ album drives my little ones to dancing and an urge to press the “Play” button over and over and over and over again, it has fulfilled its promise. Yes, conceptual originality sometimes contributes to “new lyrical ground”, as the critic here suggests, but concept is not the missing ingredient in this album. If you were to judge “A Frog Named Sam” as a totality of experiences, and not a segregation of elements, you would find that simplicity IS the underlining concept. for a very strong theme and an actual concept. In the minds of consumers these are the products that turn into brands and eventually into a whole cultural experience. Speaking of culture, if you were to take a chronological interest in Ben Rudnick’s CD art, you would find out that it does exactly that – it creates a cultural experience. From the tidy looking “Emily Songs” cover, through the psychedelic “Fun and Games”, the rocket-fueled juiciness of “Blast Off!” the nostalgic style of “Challenger Baseball Song”, the woodblock style of “Grace’s Bell”, to the floaty but thickly-contoured “A Frog Named Sam”, the artwork never seizes to impress the eye. And the main reason for it – not its professionalism, nor its stylistic consistency, but its continuous transgression. And believe it or not, transgression is equally appreciated by kids and adults. Ben Rudnick’s culture is made of lyrical innocence and artistic transgression, and that's what makes the whole experience unforgettable. So if “high-art” and “new lyrical ground” is your place to start, this is not the culture for you and your kids. But if you seek simplicity and a constant innovation in the most modest, infectious and kids-like way, you are in for a “blast off”. My WHOLE family LOVES this CD! We can't get enough!! My 9 mo old dances around and smiles and laughs along. My husband (a self proclaimed music snob) really DIGS this music. I sing “A Frog Named Sam” and a lot of the other songs while my little guy takes a bath, plays or has lunch. This CD is one of our MUST HAVES on car rides. Right up there with diapers and his blankey! As a Dad of a 4.5 yr old boy and 1.5 yr old girl, I look for music that the kids will love, sing and dance, and play over and over. And if Mom and I can enjoy it, too, that's a nice bonus. I don't really give much though to the quality of art work on the cover or care much which music category it may fit. 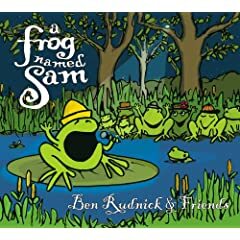 That's why I very highly recommend Ben Rudnick and Friends' A Frog Named Sam CD, as it is tremendous! Our family has been listening to it together, over and over, having mini-concerts (kids arguing over which one is Ben), and each of us has our own personal favorite (mine is Race Car). For us, Sam is the culmination of our Ben Rudnick collection, but if it is your first experience with Ben and Friends, you'll love it!!! I agree – this is one FUN and DANCEABLE CD! My kids (ages 3 and 6) and I had so much fun dancing to this CD the first time we heard it that they asked to play it again and we danced happily away a full second time through – stopping only for water breaks here and there. The fact that that there is a variety of musical styles on the disc (folk, jazz, jigs) makes for an interesting dance experience full of surprises and laughs. Regardless of whether you like to dance or not, from beginning to end “A Frog Named Sam” makes you feel joyful and good and carefree, which so nicely captures the attitudes of children, and also transports us stressed-out adults into a better, happier place. I love this CD!